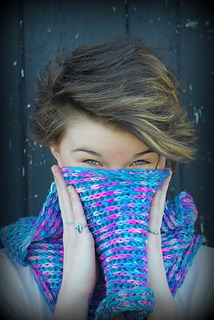 Lorna's Laces is a hand dyed yarn company from Chicago. This 100% Superwash Wool yarn is soft and squishy, perfect for brioche projects. Brioche, the latest knitting craze creates a squishy fabric that is completely reversible and easy to wear. Pair a multi with a nearly solid for a reversible look that is both fun and fashionable. There are many different colors to choose from, everything from adorable to zany. Check out the new Splattershot colors for a unqiue, speckled look. A great project to test out whether brioche is right for you is Samantha Hardman's Bitchin Brioche Cowl, a basic brioche cowl for lots of practice with a warm, cozy end product. Pattern link available here: Bitchin Brioche Cowl. Knitting Gauge: 4 – 5 sts = 1"
Crochet Gauge: 8-11 sc = 4"